Where has it come from, this strident male voice insisting that women are so dangerous that they must neither be seen nor heard? When did woman, created equally and simultaneously alongside man in the first creation story (Genesis 1:27) lose that position in the eyes of some commentators so that they not only feel the need to hide women away from the public eye and mute our voices, but go on to claim that this is God’s will as indicated in bible? And then, for good measure, decree that women cannot study these texts for reasons of modesty? The position of women in Judaism is under assault and despite what some may say, this is essentially a modern phenomenon. Biblical women are strong personalities, active players in the narrative. Sarah, like Abraham, “makes souls” (Genesis 12:5). God tells Abraham “in all that Sarah says to you, listen to her voice (obey her); for through Isaac shall your descendants be called. (gen 21:12) making Sarah as important a transmitter of covenant as Abraham. The other matriarchs are equally powerful players in the narrative, as are many other women in bible. The Talmud tells of the seven prophetesses in bible (BT Megillah 14a) including Deborah, the only person in the book of Judges to actually be seen making judgements for the Children of Israel who came to her for rulings (Judges 4:5). Women scholars can be found in our tradition down the years: Talmud records the comments if first century Ima Shalom, In the 2nd Century Beruriah, daughter of Rabbi Hananiah ben Teradyon was such a scholar that Talmud tells us “she learned three hundred laws from three hundred teachers in one day” (BT. Pesachim 62b). Rashi’s daughters learned Talmud. We have archaeological evidence that there were women leaders in the ancient synagogues from the second century on, that they were active participants in ancient Jewish society long before the rabbinic period. Women have affected tradition through the generations, be it taking on mikveh for themselves or creating their own prayers and techines. Even the way we pray the amidah is based on Hannah’s prayer (BT Berachot 31). So why now as the rest of the world is waking to the benefits of women in public space of is one part of the Jewish world going in the other direction? And how can traditional Jews recite Eshet Chayil (Proverbs 31:10-31) which celebrates the domestic and commercial skills of a good woman, and at the same time declare that the mere presence of a woman in the public sphere will cause licentious thoughts and so must be prevented at all costs? The segregation of women in prayer and study is a case in point. Mechitza is sometimes cited today as the gold standard of orthodoxy – yet less than a generation ago many orthodox synagogues did not require such a barrier between the sexes. Its origin is neither biblical nor from Temple period – indeed it most likely entered Jewish practise in medieval times from the practises of the people among whom the Jewish people were living. According to Talmud there was only one day in the year when men and women were separated, on the exceedingly festive Simchat Beit Ha’Sho’eva. (Sukkah 5:1) Fascinatingly, according to the Talmud, on this day in order to prevent too much rowdy behaviour, there was a rabbinic enactment (takkanah) to separate the men and women, and after some trial an error putting the men outside the courtyard and the women inside, then vice versa, the solution was hit upon – to build a gallery above the courtyard and to place the women safely above the fray. Fancy that- a rabbinic enactment changing the plans of the Temple! Imagine the daring to create an architectural reformation that goes against the original divine blueprint. The Talmudic Rabbis are well aware of this huge dissonance and dislocation in the tradition in order to respond to the people and attempted to support it with a verse from Zechariah, and as all those who study or write response know, supporting verses from the prophetic books are not enough to create Halacha, and most certainly they are not of the category of biblical law. The sleight of hand would be amusingly audacious if it has not meant within the last generation or so that it has disappeared behind the “because I say so” school of responsa, and emerged as a biblical imperative that must not be questioned. The area of the Second Temple known as the Ezrat Nashim was not an area designated especially for women as is popularly imagined, but the first courtyard as one entered the Temple precinct and it is clear that both men and women mingled within it. There is no evidence – either textual or physical, that men and women were separated during public worship until the middle ages when we find the statement in the tenth century Tana D’vei Eliyahu that “a man should not stand among women and pray, because he is likely to be distracted by them” – a statement that seems to imply that men are indeed praying alongside women. So why in the last few years has one part of the orthodox world chose to focus on taking women out of public space? Why have the laws of tzniut (modesty) become not a spiritual aid, but a stick with which to beat girls and women, to force them to suppress much of their own selves as an act of piety. 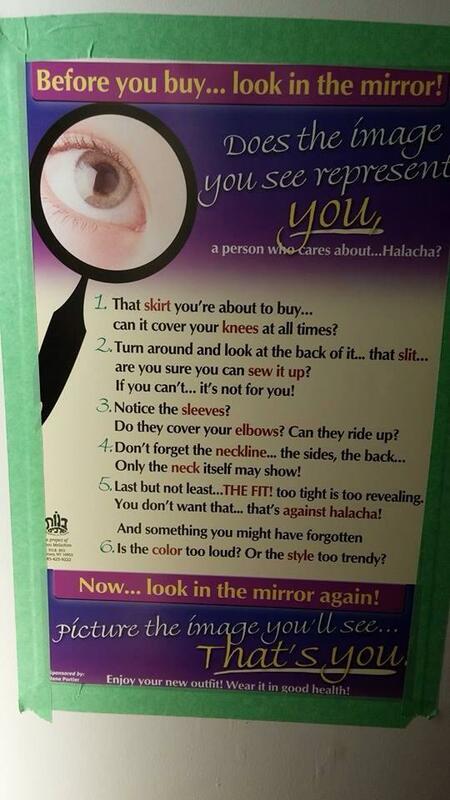 Posters abound in the frum world, such as the ones shown on this blog, warning women that if they do not wear suitably modest clothing the messiah will not come, they may cause ill health to others and even to themselves, the world is dependent on their covering up and ensuring that no one might notice them at all as women. 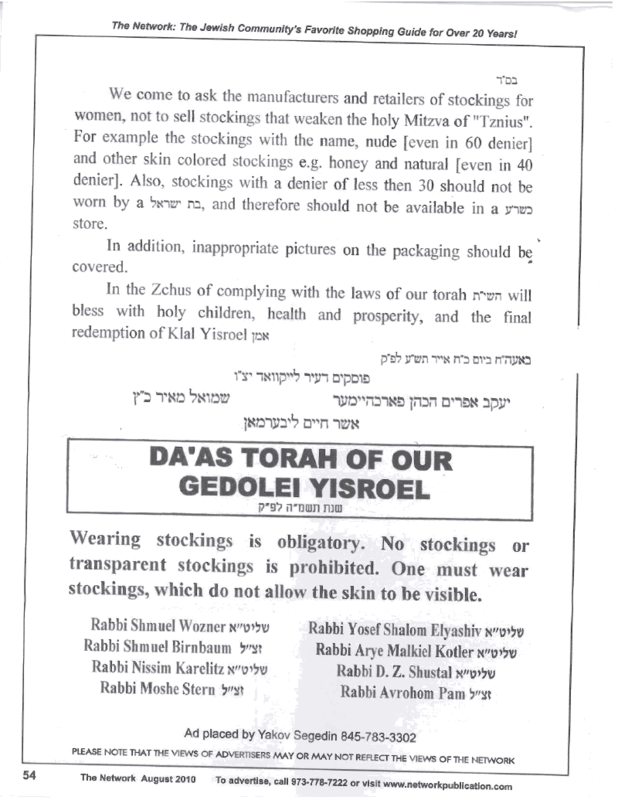 There are attempts to silence the voices of women in public, to prevent women singing even at secular events such as Israel Independence Day or Holocaust Memorial Day, although confusingly the responsa about what and where women may sing are so many and varied that what one rabbi may see as the worst possible time and place is noted by another as the only permissible way for women to sing…. And now women’s prayer minyanim are under attack, something that has happened throughout the ages in the Jewish world as attested by the many prayer books left behind, women praying together, studying and reading Torah together, are suddenly in the firing line for some rabbis determined to have a ruling calling them inauthentic, and outside the orthodox fold. As a woman rabbi trained and working in a progressive stream of Judaism, this concerns me deeply. While I know enough to know how to challenge some of the so called traditions and see them in their context, and can read and critique the responsa which are steering this flight into a mind-set one cannot even really call medieval, I also know that there is a growing determination to control women as never before, and this worries me. Where is it coming from this strident male voice that is insisting that women are dangerous, that sexuality is impure, that authenticity can be found in a mind set so far from biblical and most rabbinic sources as to be from a different world. What is happening in some parts of the Jewish world that it is consuming not only the rights to self expression of women, but also the dynamism and scholarship and thoughtfulness of so many years in order to make a one size fits all costume to clothe and smooth away and hide from view the diversity, the openness and the audacity of our rabbinic ancestors.